Tunisia on the coast of North Africa is neatly sandwiched between Libya and Algeria, with its southernmost part embedded in the awesome Sahara Desert. 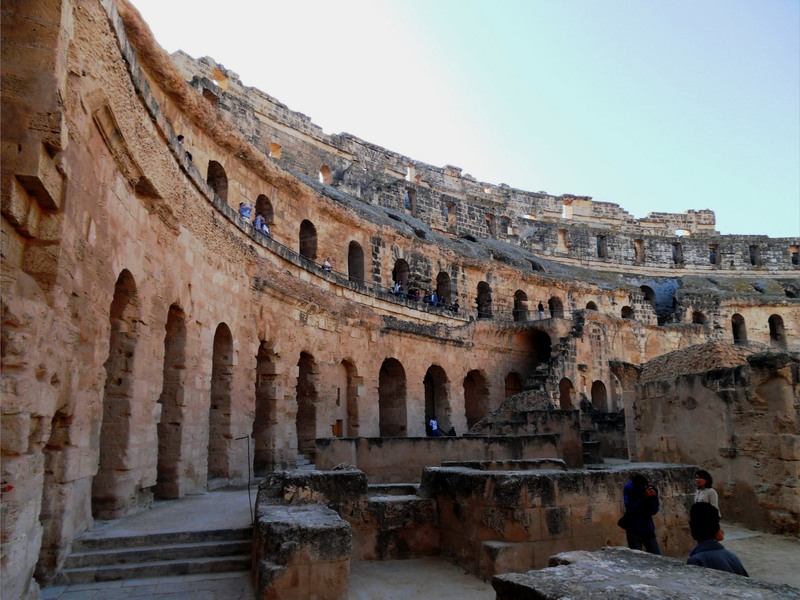 Its history goes back to ancient times, when the great city of Carthage was a serious rival to imperial Rome and ended up being flattened at the end of a ruthless struggle for supremacy in the Mediterranean, and there are many other sites of cultural and historic interest in this exotic country. The remains of Carthage are located on the outskirts of Tunis, the capital city. The wars between this ancient city and Rome lasted from 264 to 146 BC, a period which saw Hannibal’s march across the Alps and the sacking of Carthage by Roman legions. 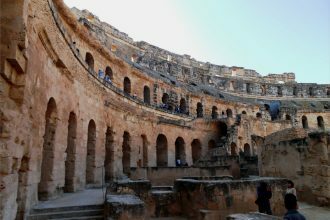 The Romans eventually settled themselves in and used Carthage to administer their African provinces, and today just about all of the remains are Roman, including temples, theatres, baths and villas. Most are in ruins, but the Antoine Baths, the largest ever built by the ultra-hygienic Romans, are still impressive in their decayed grandeur, and the amphitheatre is still stunning. The best view of the legendary city is obtained from the nearby Byrsa Hill. Take the car along the Avenue Habib Bourguiba from Tunis city centre to Sidi Bou Said and explore the awesome ruins on foot, preferably with a local guide to get the most out of your visit. To get a real experience of the Arabian Nights, go to the al-Madinha, or Medina, in the old part of Tunis. It was constructed in the 7th century AD, and as Tunis was recognised as the largest and richest city of the whole Islamic world between the 12th and 16th centuries, the exquisite Medina bears witness to its former glory. Visiting the Medina today is like taking a few steps back in time to wander through the maze of winding, narrow alleyways and picking up anything from hand-crafted jewellery and exotic spices to hand-made carpets and brassware. The Medina’s 9th century Ez-Zitouna Mosque, or Mosque of the Olive Tree, and the Souk el Attarine with its perfume makers, are especially worth dropping into. There’s a great collection of mosaics in the Bardo Museum and also a stunning Ottoman-style mosque, the Sisi Yousef, which was built in the 17th century. This is a country of great and dry open spaces, semi-desert or completely so in parts, and you really need your own wheels to get around the place, this is definitely the best way of exploring all that Tunisia has to offer. One of the most famous destinations for visitors to Tunisia is the village of Matmata, where the opening scenes of Star Wars were filmed. It has a lunar landscape and cave dwellings that attract tourists from around the world, and not only film fans. The ancient Berber tribes dug homes into the rocks here over a millennium ago to escape the surface heat, with interconnecting passageways to create a true subterranean city. Come here to prop up the bar in the original Star Wars cantina, now the Hotel Sidi Driss. Most visitors come on organised coach trips from Tunis, but you can take the road southwest from Gebes towards New Matmata, before transferring to camel if you like. When I visited Tunisia I was shocked at how much there was to see and do and how easy it was to get around. Such a fantastic destination! Sounds like a fascinating place to visit. Definitely added to my list.